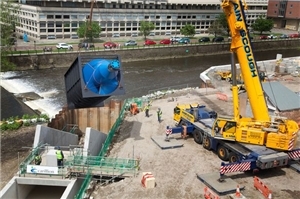 This equipment will harvest energy from the River Wear to drive a 100kW generator, capable of supplying 75% of the total energy requirement of the new Freeman’s Reach development in DurhamCity. The screw will generate energy 24 hours a day, enabling Freeman’s Reach to be awarded an A Rated Energy Performance Certificate and BREEAM Excellent status. The new turbine will continue the legacy of hydro power generation at Freeman’s Reach, which dates back more than 800 years to the original medieval Bishop’s Mill.